The EX355P has been designed to meet the requirement for a low-cost dc power supply that can be remotely controlled using an RS-232 interface. A simple remote interface is provided which can be used to set voltage and current levels and operate the output on/off. Status monitoring enables actual current or actual voltage to be read back together with the operational mode (constant voltage or constant current). The RS-232 interface is fully opto-isolated from the power supply output thus eliminating any restrictions on how the output is connected. Front panel rotary encoders allow the units to operated as conventional bench power supplies. Front panel control can be locked out when using remote control. 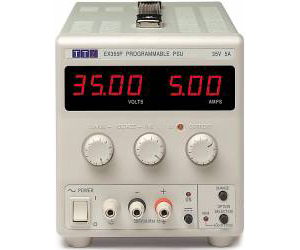 The EX355P uses mixed mode regulation with a switch-mode pre-regulator followed by a linear post regulator. It can provide 175 watts and is an extension to the highly successful EX series of dc bench power supplies (see separate data).